As mentioned previously, in the original Greek there is only one word for “man” – none for husband; and only one Greek word for “woman” – none for wife. We must determine from the context whether a text is talking about women in general, or specifically about wives. The apostle Paul wrote letters to churches to mediate in the problems of each church and set guidelines for them to follow. Many believe that Paul set up a rule that all Christian women must “keep silent” during church services. Some extend this to mean that women may not offer prayers, lead songs, read scriptures aloud or have any leadership role during or after services. To limit the women of God in such a way is a serious thing, and we must be very sure that Paul’s words are being understood correctly. 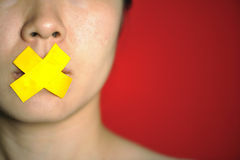 The word for “speak” (laleō) does not necessarily mean a formal role in the pulpit—it is a general word that can also be translated “talk.” Paul used a general word to say that women should not talk, and we have to make an interpretive choice: Was he prohibiting formal speaking roles, or talk in the audience, or something else? Paul says that instead of speaking, women should be in submission. This implies that the Corinthian women were speaking in an insubordinate way. The fact that Paul said in Chapter 11that women could pray and prophesy, and in Chapter 14that two or three people could prophesy in a worship service, shows that women are allowed to have a slot in the speaking schedule. It is not insubordinate for them to speak prophecies; it is therefore likely that Paul is prohibiting some less-formal speaking, such as chatter or comments from the audience. Acts 21:9 reveals that Phillip the evangelist had “four virgin daughters who prophesied.” A true prophecy is a message from God to a specific person or church. Would any minister of God refuse to let a woman deliver a true message that God had given her for the people of God? We have every reason to believe that converted Christian women such as the daughters of Phillip were participating in church services– using their own God-given spiritual gifts, and Paul did not oppose their participation. Paul has already indicated that women can pray and prophesy in church “But every woman who prays or prophesies with her head uncovered dishonors her head – it is the same as having her head shaved” (1 Cor 11:5),and a worship service includes two or three people prophesying in turn “Two or three prophets should speak, and the others should weigh carefully what is said. And if a revelation comes to someone who is sitting down, the first speaker should stop. For you can all prophesy in turn so that everyone may be instructed and encouraged. The spirits of prophets are subject to the control of prophets” (14:29-32). This means that it is permissible for women to have formal speaking roles in the church. Paul was apparently forbidding some other type of speech. Just as he did not allow tongue-speakers or prophets to speak out of turn, he did not want women to speak out of turn, saying things in such a way that they were breaking social customs about what is appropriate. In the Greco-Roman society, women were given authority in the household, but rarely had opportunity for public speaking. The average woman was less educated and had little experience in public assemblies; this may have contributed to the problem in Corinth. In 1 Cor. 12:4-11, Paul teaches that both men and women are given manifestation of the Holy Spirit– spiritual gifts– for the benefit of the entire church, not just for their own benefit. Paul is going out of his way to enforce that “each one” is given a spiritual gift/ role or part to play in God’s Church. God gives these roles as He desires– only God can decide what spiritual gift is given to each man and woman! Paul does not say anything to indicate that “these public roles are the male gifts, and these private roles are the female gifts” as some teach. “Let those wives keep silent…” Not ALL women, just those causing confusion! Paul is urging the churches to start a policy of limiting the participation of “those”wives, unconverted wives, who must subject themselves to their converted husbands, not causing any further disruption. Paul’s reference to “the Law” may be a reference to Genesis 3:16 which relates to being subject to a husband in marriage. It is a travesty that men have systematically denied women the opportunity to utilize the full extent of their gifts for God’s glory. This denial is based on a few highly passages in Scripture, such as1 Cor 14:34-35 and 1 Tim2:12.Perhaps the obvious must again be stated: Sound hermeneutical principles warn against drawing unwarranted inferences from passages fraught with numerous interpretive issues. Yet, despite this knowledge, scholars, church leaders, and lay people continue to utilize such passages to deny or limit women the full exercise of their God-given gifts. Scripture teaches us that the gifts and callings of God are given to all members of the body of Christ by the Holy Spirit (Rom 12:3-8; 1 Cor. 12:4-11; Eph 4:7-11; 1 Pet 4:10-11). None of these gifts or office is the exclusive prerogative of men. This oppressive behavior against women grieves the Holy Spirit and hinders the Spirit’s work in the church. Much confusion in the church today over “women in ministry” results from Bible scholars and others who fail to rightly divide and present God’s truth. Many evangelical scholars have boldly attempted to break down traditional assumptions and biases that prevent women from speaking and ministering in churches as pastors and teachers of the Word. A tremendous obstacle still remains. Bibles generally do not present alternative interpretive options of many “problem passages”. 1 Cor 14:34-35 illustrates this point. Some day all Christians will stand before God to give an account of their lives and actions. We may be asked: What have you done with the woman I have anointed to minister in My Church? Did you hinder or accept these women? My prayer is that more Christian leaders and lay people not hinder the move of the Holy Spirit in the lives of women called to ministry. I’d love to hear from you, do drop a comment. God bless you. Wow this is a great eye opener. You know I have never being in support of hindering women to participate in Church activities, not just because am a woman but because I know the Holy Spirit is not limited by gender, and great lady the way you've broken this down, it is just amazing. God is really using you and taking you places. Well-done. Thank you so much Harobed, your comment warms my heart. God bless you.